ROLLO, ANDREW, 5th Baron ROLLO in the peerage of Scotland, army officer; b. 18 Nov. 1703 at Duncrub, Perthshire, Scotland, the eldest son of Robert, 4th Baron Rollo, and Mary Rollo; m. 22 April 1727 to Catharine Murray; m. 16 Feb. 1765 to Elizabeth Moray; d. 2 June 1765 in Leicester, England. Andrew Rollo entered the army at the age of 40 and so distinguished himself at the battle of Dettingen (Bavaria) in 1743 that he was given a captaincy in the 22nd regiment. He became major in the same regiment on 1 June 1750 and succeeded to the title of Rollo on his father’s death the following year. A promotion gave him the rank of lieutenant-colonel on 22 Nov. 1756. The year 1757 found Rollo in North America, fighting in the Seven Years’ War. He participated in operations in the Albany and Schenectady areas of New York that autumn. 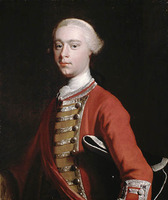 On 20 Jan. 1758, while the 22nd regiment under his command was wintering at Halifax, Nova Scotia, he was made colonel “in America.” In May 1758 his regiment joined the forces preparing to besiege Louisbourg, Île Royale (Cape Breton Island), and during the siege he led one of the brigades ordered to the Lorembec (Lorraine) area. Following the capture of Louisbourg, Rollo was sent to Île Saint-Jean (Prince Edward Island) to arrange for the capitulation of that island and the removal of its inhabitants and to erect a fort. By the time of his departure for Louisbourg in November he had embarked 2,200 islanders for France and had built Fort Amherst at Port-La-Joie. 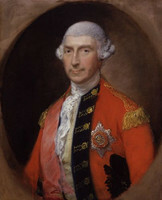 Rollo remained with his regiment at Louisbourg until 1 July 1760, when he sailed with the 22nd and the 40th regiments to join General James Murray*’s campaign in Canada. During its journey up the St Lawrence Rollo’s detachment disarmed and administered an oath of neutrality to Canadians living on its banks, finally joining the main British force at Lac Saint-Pierre on 18 August. The following day Rollo was given the local rank of brigadier-general and command of the reserve in Murray’s order of battle. On 22 August he led his regiments in a raid on Sorel that “laid waste the greatest part of the parish,” many of whose inhabitants were still in arms. “I pray God this example may suffice,” wrote Murray, who had ordered the action, “for my nature revolts, when this becomes a necessary part of my duty.” The parish was doubly unfortunate since Bourlamaque, who was in charge of the French defences at Sorel, was having houses burned to prevent desertions from his forces. After the capture of Montreal on 8 Sept. 1760 Rollo commanded temporarily at “the island of Teresa” (Île Sainte-Thérèse); he was then ordered to assist in the fortification of Crown Point (formerly the site of Fort Saint-Frédéric) before proceeding with his regiment to Albany, where he arrived on 24 November. 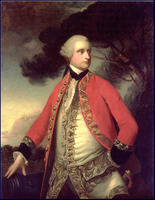 On 3 May 1761 he sailed from New York to the West Indies to take part in the successful British attack on Dominique (Dominica). He was subsequently made commander-in-chief on the island. He became full colonel on 19 Feb. 1762 and took a prominent part in the capture of Martinique that month and in the campaign against Havana the ensuing spring and summer. In July 1762 the lingering sickness that was to cause his death some three years later forced him to leave for England. Lord Rollo, although joining the army relatively late in life, proved himself a competent commander and during his service in North America gained the confidence of the commander-in-chief, General Jeffery Amherst*. He was buried with full military honours at St Margaret’s Church, Leicester. His son John, who served with him in the St Lawrence and on Martinique, predeceased him. PRO, CO 5/53, ff.154–55; Ind. 5442, f.115; 5444, f.14; WO 1/1, ff.102, 354v–55; 34/7, ff.225–25v, 232; 34/17, ff.2–3, 81–82v; 34/46b, ff.165, 175–76, 191; 34/55, ff.37–39. Knox, Historical journal (Doughty). DNB. The Scots peerage, founded on Wood’s edition of Sir Robert Douglas’s peerage of Scotland, ed. J. B. Paul (9v., Edinburgh, 1904–14), VII, 180–211. Harvey, French régime in P.E.I., 189–97. Stanley, New France. John Humphreys, “ROLLO, ANDREW, 5th Baron ROLLO,” in Dictionary of Canadian Biography, vol. 3, University of Toronto/Université Laval, 2003–, accessed April 22, 2019, http://www.biographi.ca/en/bio/rollo_andrew_3E.html.